‘Matsya’ in Sanskrit means ‘Fish’. Matsya avatar is the first incarnation of Lord Vishnu. Many millions of years ago, there was a great king called Manu. Every day, in the mornings, King Manu, walked up to the river, got waist deep in water and prayed to God. One day during his prayer, he cupped a handful of water in his hands to offer to God. He saw a small fish in the water that was in hands. He was about to let go of the fish but the small fish begged him to save his life. The fish told him that if he let him go back to the river, the big fish would eat him alive. King Manu felt sorry for the fish and so took the fish home. He put the fish in a small bowl of water and he went back to his daily routines. The next morning King Manu went to have a look at the fish. He was surprised to see the fish had grown overnight. The fish now almost filled the whole bowl. King Manu transferred the fish into a much larger bowl. The next morning the fish had almost filled up the new large bowl as well….King Manu immediately realized that this was no ordinary fish. Something in him told him that this fish was the God Himself. He knelt down and prayed. 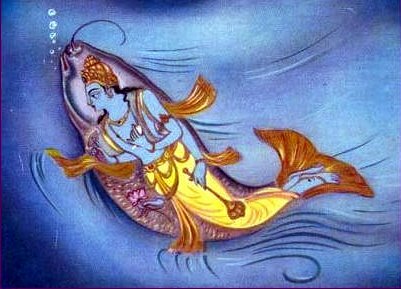 Lord Vishnu (in the form of the fish) tells him that in seven days there is going to be a huge flood which will destroy the entire planet. Hence it is important that all the species on this planet be preserved. To enable this to happen He asks Manu to build a huge boat and fill it up with samples of every species and then abode the boat and set it sail on the ocean and wait for Him. Manu and his wife did as instructed. The giant Fish appeared and towed the boat which was tied to a horn he had manifested on his head. As predicted there was a huge flood and it destroyed the planet. Manu and his wife were safe (since they were on the boat). And along with Manu and his wife were the samples of every species. After a few years, the havoc stopped and normality returned. The boat was then towed to a land. The king and his queen started a new life using the samples of various species and were able to create a new life on earth.